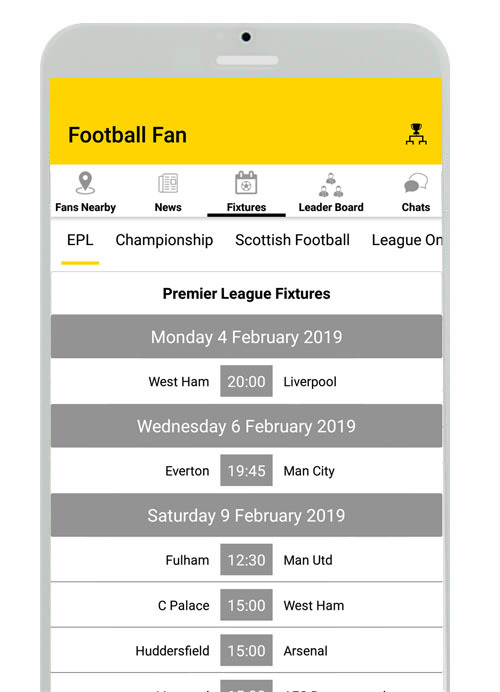 Download “Football Fan” app for Free on your iPhone from Apple iOS App Store or on your Android Phone from Google Android App Store. Then scroll through the app visual images below as per your smart phone. 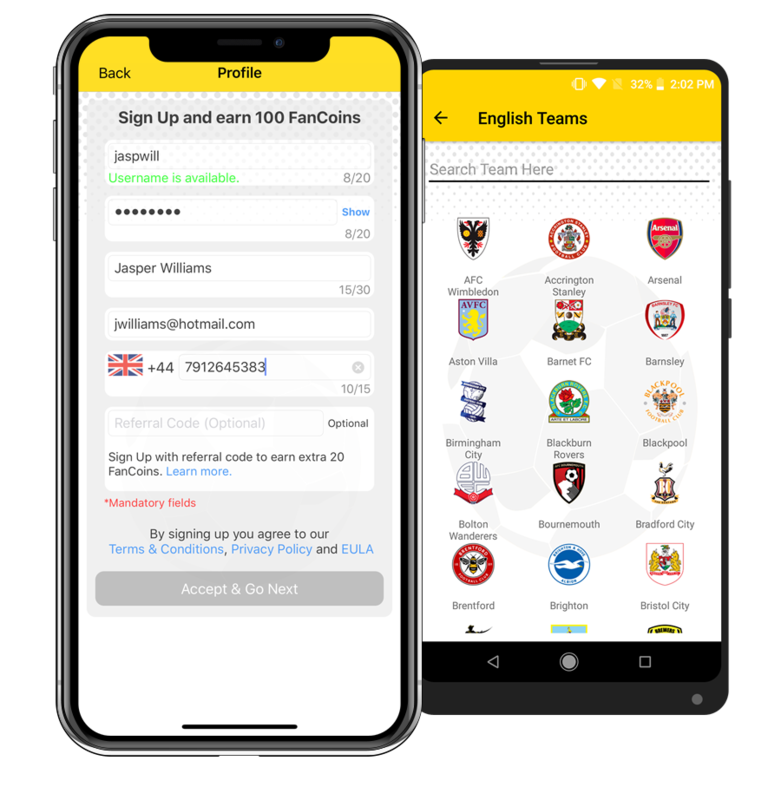 Get FanCoins rewards by contributing to the app for the good of Football Fans community worldwide. This is a way of saying thank you for your efforts. 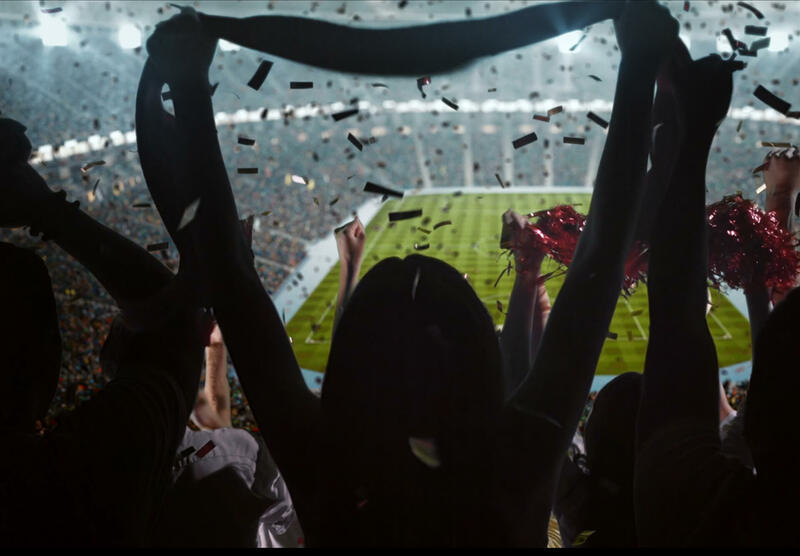 Sign up in few simple steps and join the global community of Football Fans. 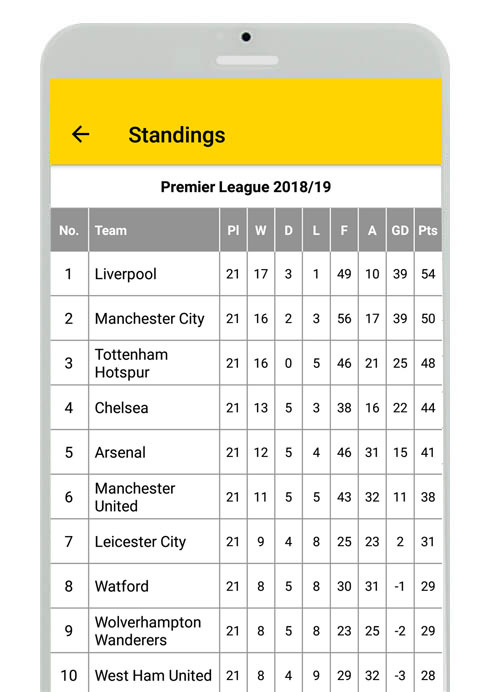 Using your mobile number you can even find your friends on Football Fan. 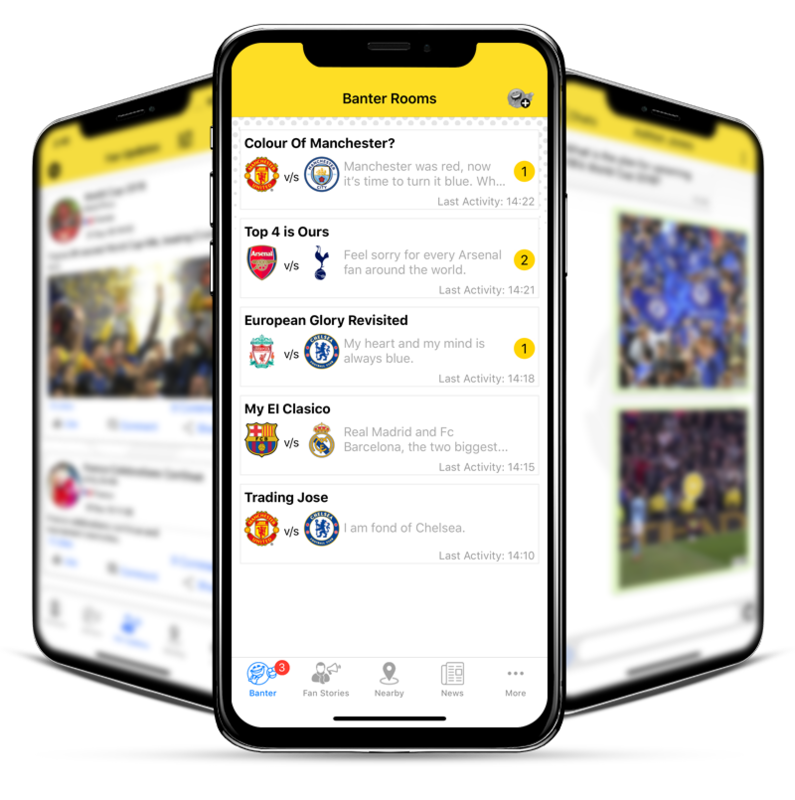 Personalise by adding your favourite Football teams to your profile and start a conversation with other like-minded Fans. 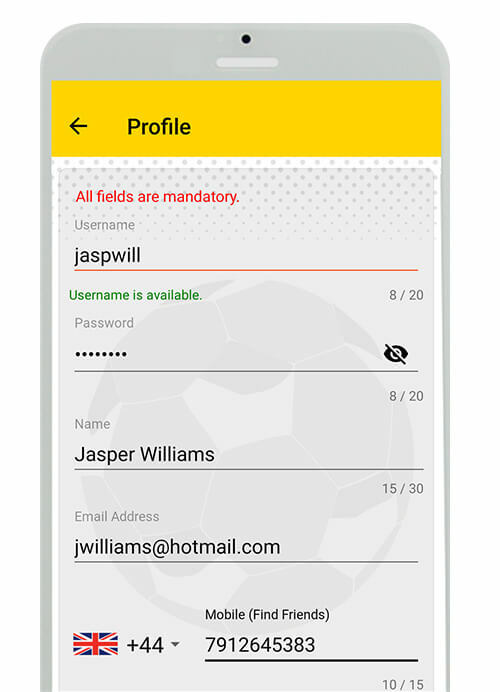 Using your mobile number you can find your friends on Football Fan or you can even invite them to join Football Fan community. Simply select your favourite team & an opposition team, give it a name and start posting messages, pictures or videos. 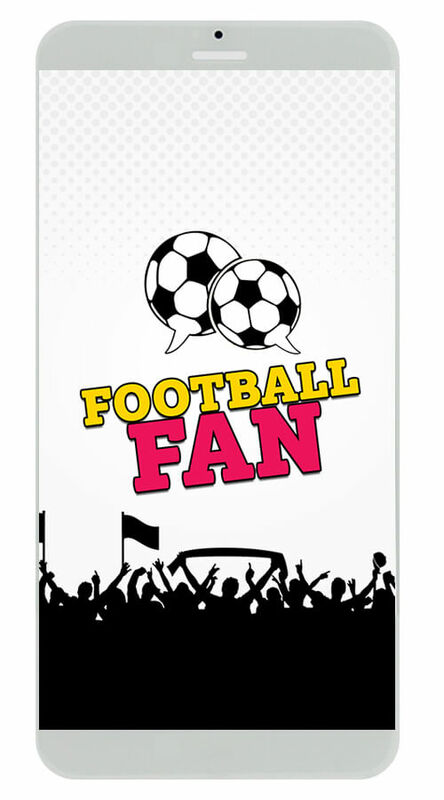 We will invite interested Fans of involved Football teams to join your Banter Room. 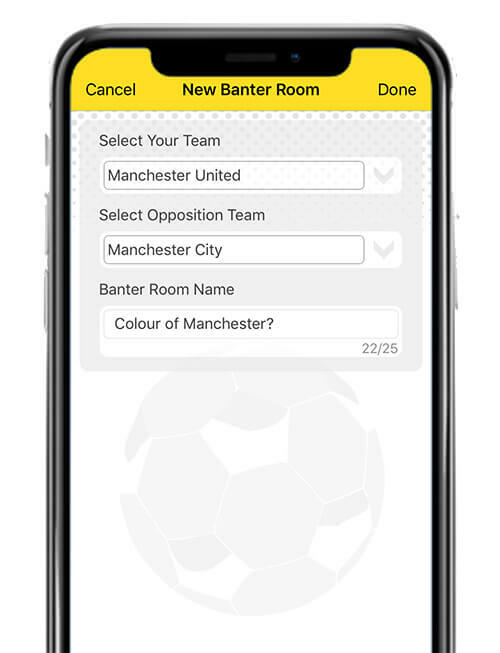 Create your new Banter Room or join any existing Banter. 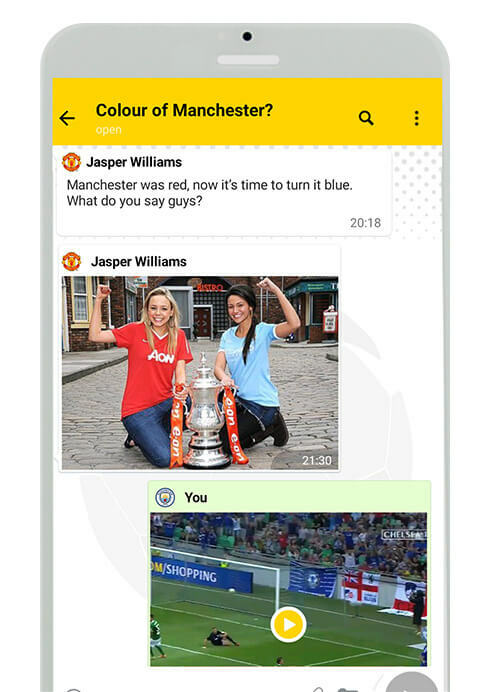 We send Banter invites automatically to interested fans. Post funniest banters as a message or a picture or even a video. Use Menu option for various handy features. 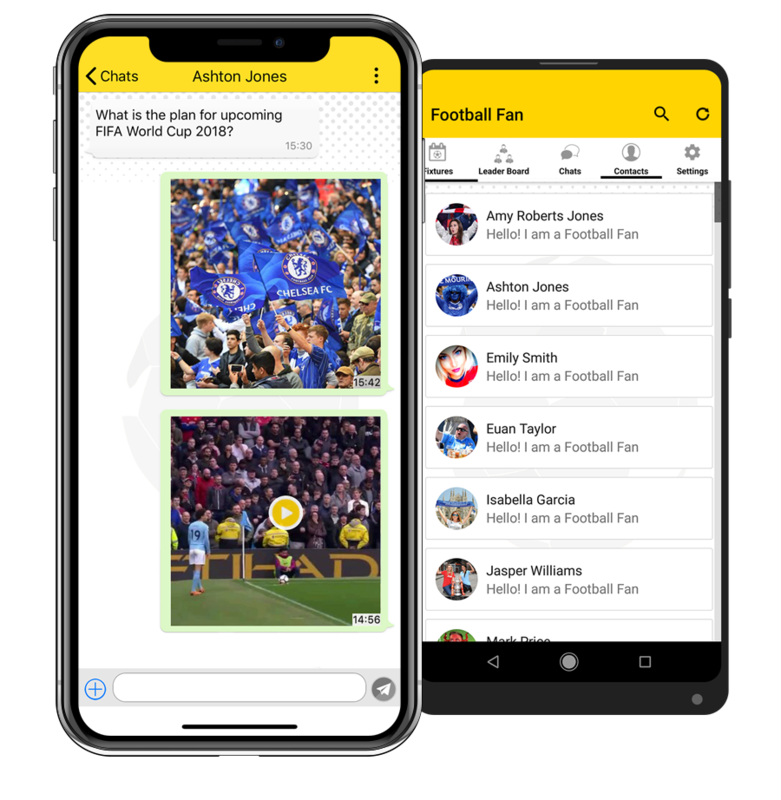 Share your Football stories publicly with other Fans in the form of messages, pictures or videos. 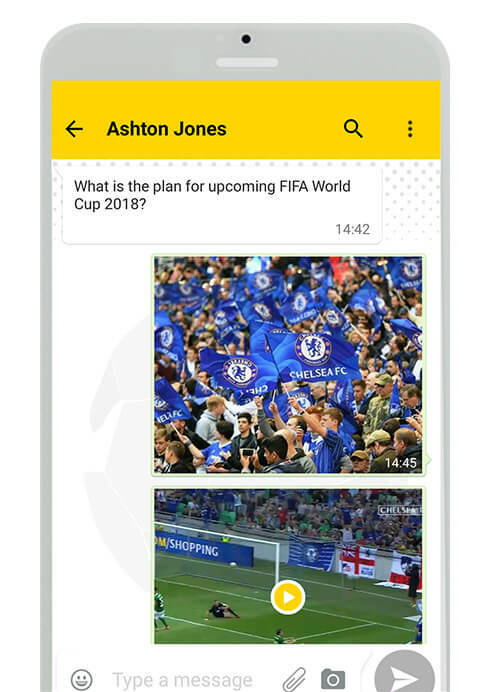 You may like or comment or filter updates for your favourite Football team(s) too. Search and initiate a secure conversation with other like-minded Football Fans of your favourite team nearby or in given place. Get latest Football news from various genuine sources around the world at a single place. 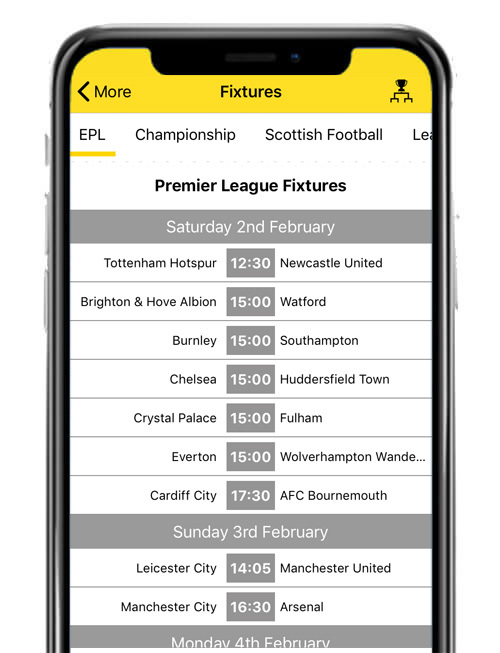 Get fixtures for various Football leagues and cup games at a single place. Get latest table standings of various Football leagues and cup games at a single place. 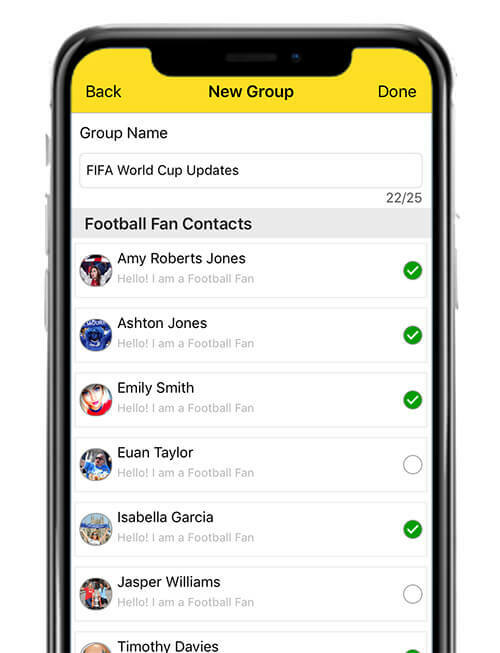 Create group chats by selecting Football Fan contacts from your address book and instantly share messages, pictures or videos with your group members. 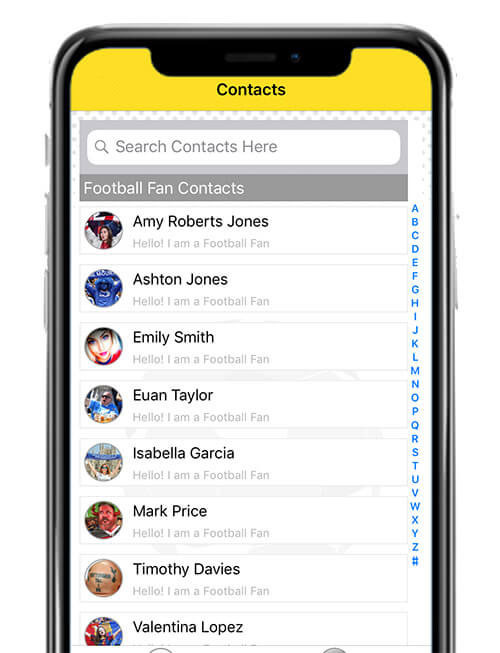 Instantly share messages, pictures or videos with any other Football Fan contact from your address book. Choose your unique Football Fan profile name before its gone. Add your email address and mobile number. Mobile number is vital to find your friends on the app. Select your primary and secondary favourite Football team(s). 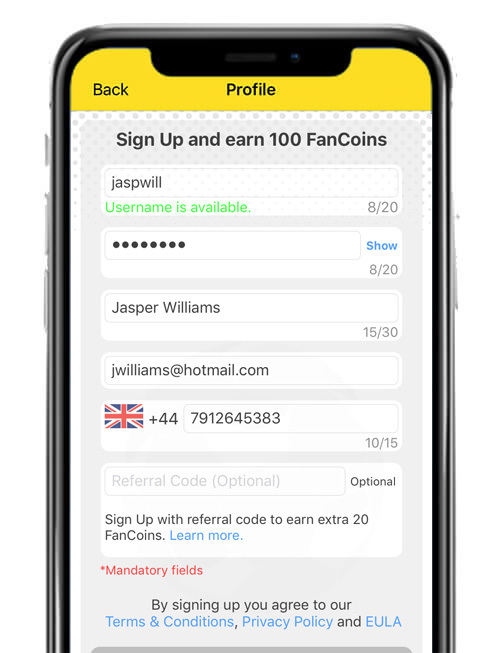 FanCoins is a reward or loyalty points system for app contributors. 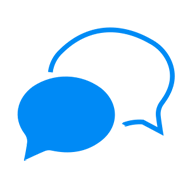 FanCoins are collected by performing various activities on the app. FanCoins can be redeemed in cash** via PayPal. FanCoins statistics & Fan ranking available via FanCoins Leader Board. ** Redemption in cash is only available on iOS app. For Android app users we are working on finding an appropriate solution. 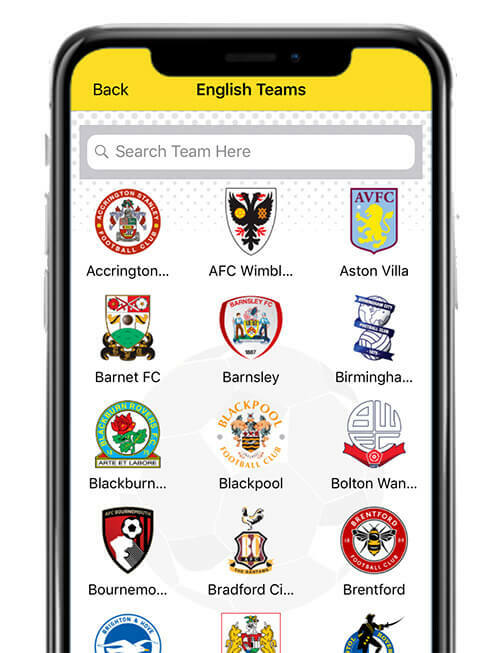 Football Fan app brings real life Football banter to iPhone and Android phones. Fans can create or join Banter Rooms between Fans of 2 Football teams. 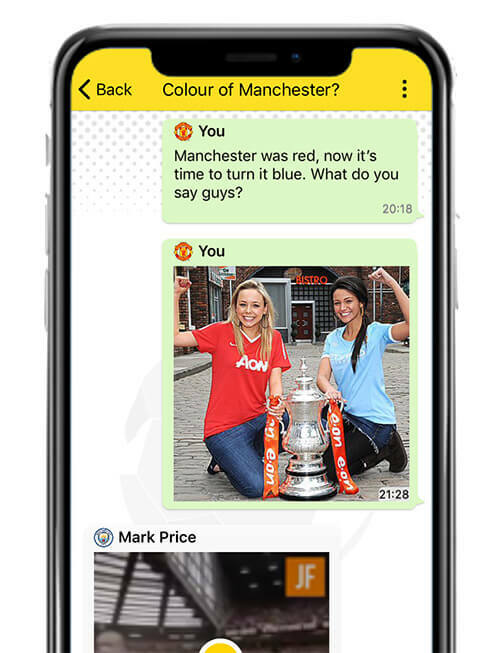 The app sends automated invites via in-app notifications to the Fans of Football teams involved in the Banter Room. Start sharing messages, pictures or videos with all the Fans. 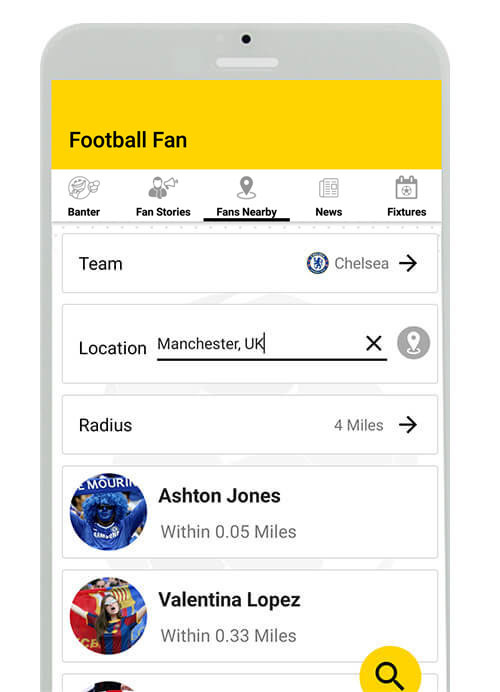 Fans can share their Football Stories from the stadium or from their home with other Fans on the app. 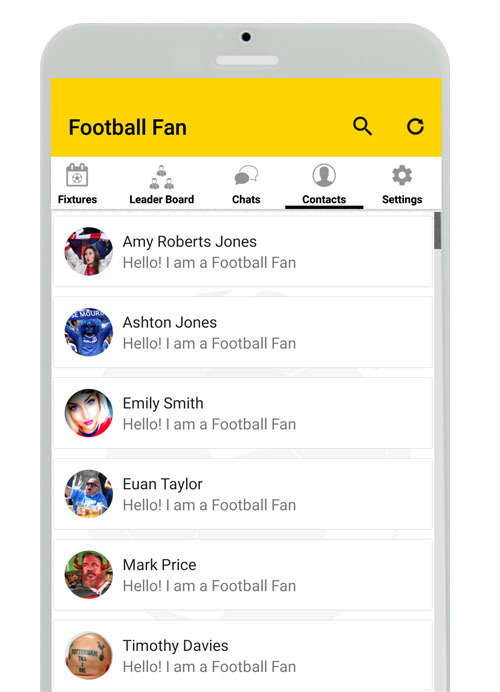 Fans can record videos or take pictures to create their own Football Stories and share with other Fans. Fans can like or comment or share these stories via other apps. 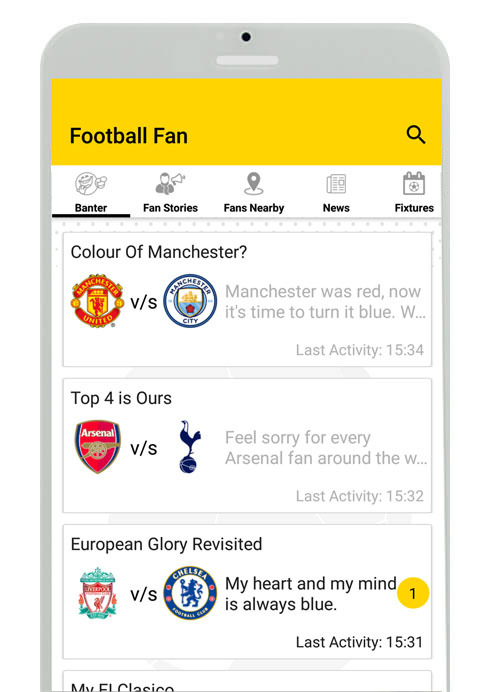 Fans can personalize Fan Stories for their favourite Football team(s) via filter option. 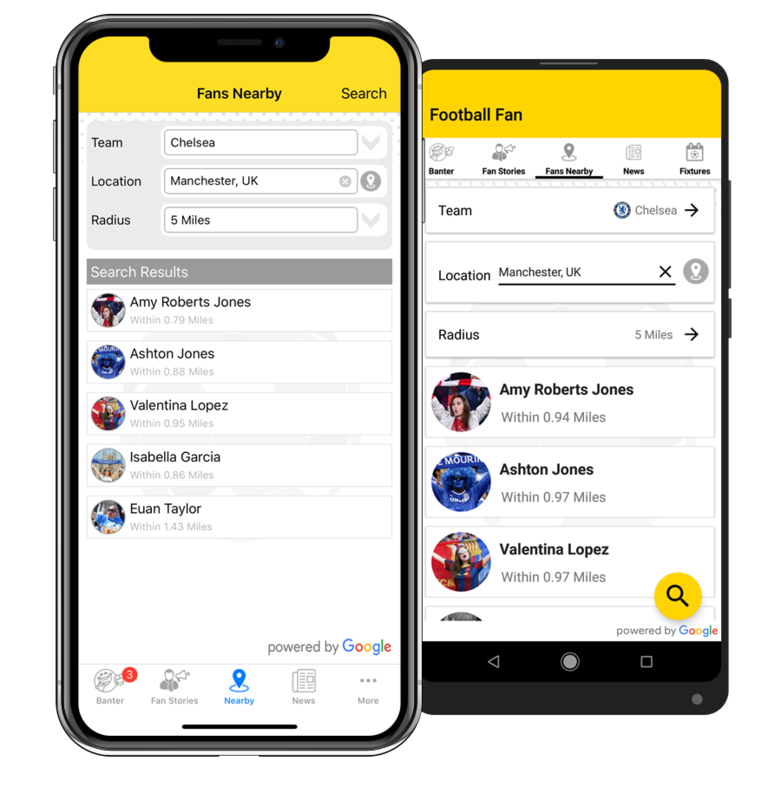 Search Football Fans of a Football team nearby or anywhere in the world. 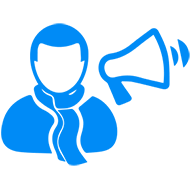 Collaborate with other Fans by sharing messages or pictures or videos. App has privacy settings available to manage privacy with strangers. Latest Football news, fixtures and table standings from around the world at a single place. Select news, fixtures and table standings for various leagues or cups games from around the world. Fans can like or comment or share news via other apps. Sync phone contacts to find your contacts on the app. Personal messaging with friends or other Football Fan contacts. 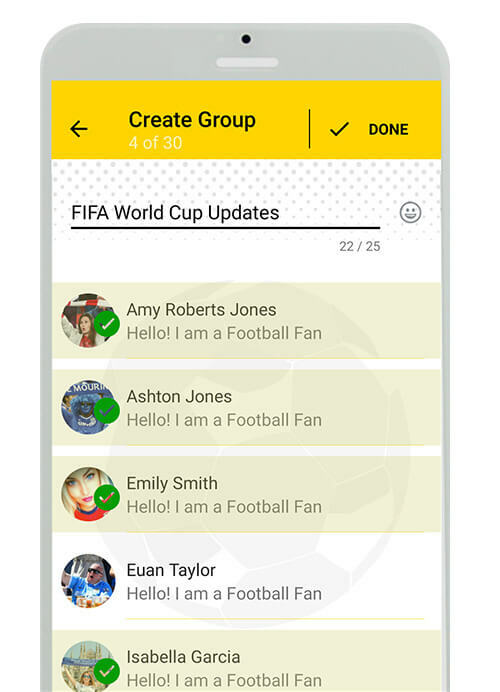 Create group messaging from Football Fan contacts. 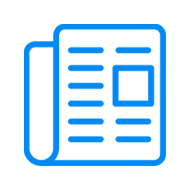 Share messages, pictures or videos instantly. Below are some of the frequently asked questions on the Football Fan app. 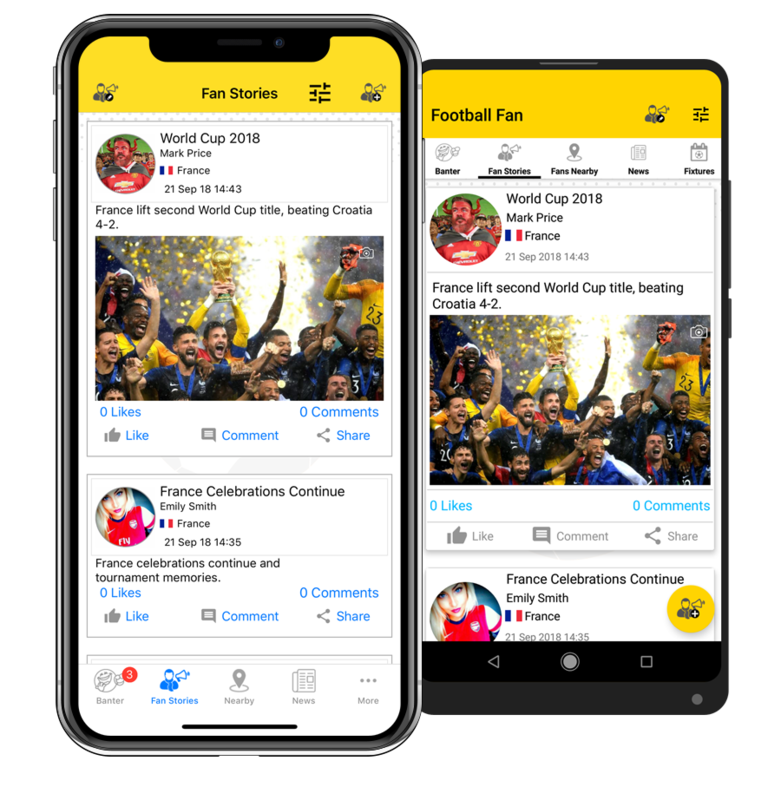 Football Fan is social networking platform to connect millions of like-minded Football Fans around the world. 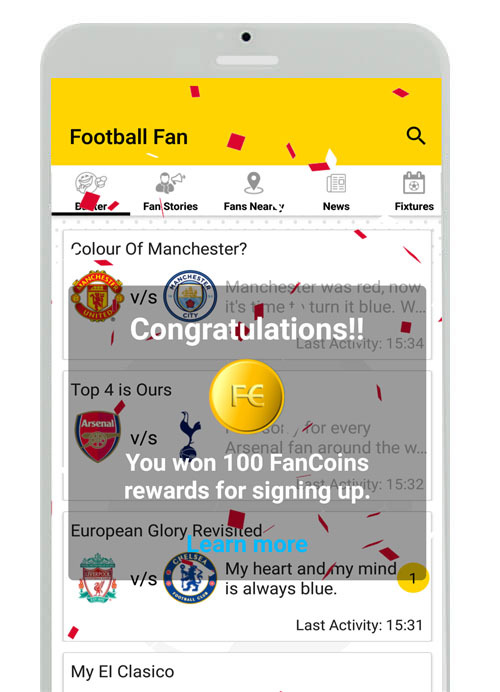 FanCoins is a reward or loyalty points system for contributors to the Football Fan app. How can I earn FanCoins rewards? 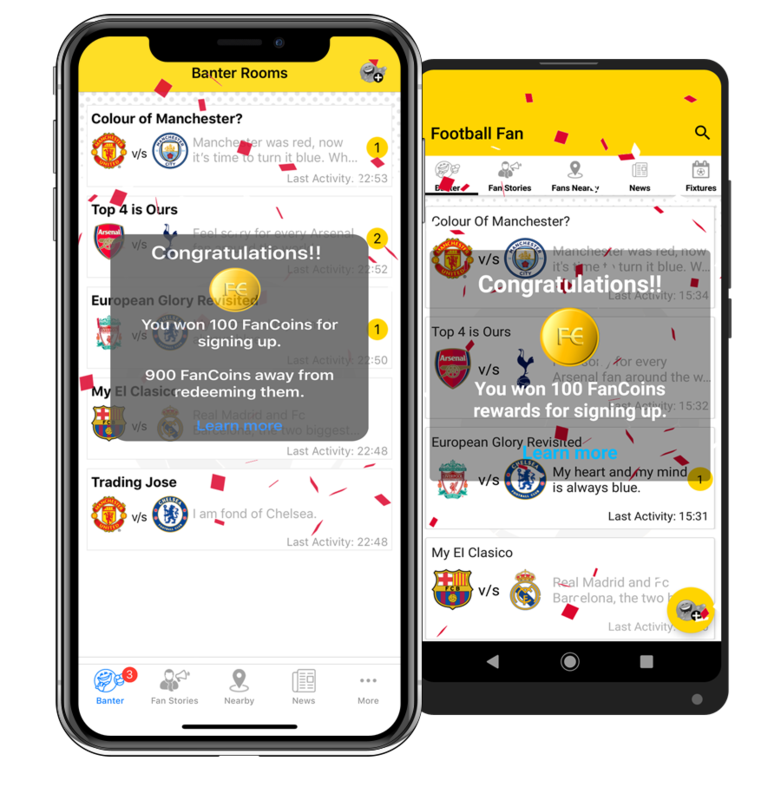 FanCoins rewards are earned by contributing to the Football Fan app for the good of Football Fans community worldwide. What are considered as contributions to the Football Fan app? a. By sign up to the app you get signing reward. b. When you create a Banter Room and a certain number of Fans join your Banter. c. Posting messages, pictures or videos under Fan Stories, Banter or Group Chats. d. Unique likes or comments on Fan Stories or News. e. Referral rewards by referring other Fans. What are not considered as contributions to Football Fan app? b. Sending messages, pictures or videos in personal chat. 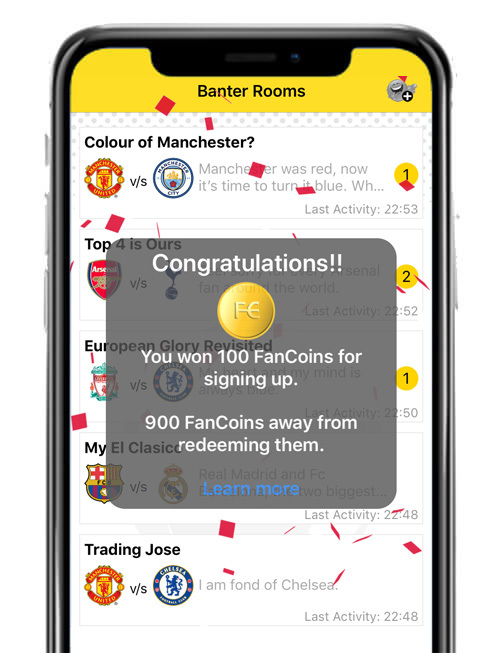 How many FanCoins rewards do I earn for eligible contributions to the Football Fan app? Are these 200 contributions calculated for a specific duration? There is no time or day restriction on your contributions. They are calculated as you contribute to the app in a day or over several days. Just download and install the app on your mobile phone from Apple iOS or Android app store. Once installed, launch the app, create your profile and you are good to go. What can I do with FanCoins rewards? Once you accumulate FanCoins rewards in multiples of 1000 you can redeem them in cash**. An example, if you have accumulated 10,200 FanCoins rewards you can redeem 10,000 FanCoins rewards and your account will still have remaining balance of 200 FanCoins rewards. In future, we may offer to redeem them against other stuff too. What is redeeming FanCoins rewards mean? Redeeming is a way to say thank you and incentivise app contributors for their efforts. You can convert your FanCoins rewards into cash**. Each 1000 FanCoins is equal to 1 GBP (Great British Pound). How do I get cash** into my account? At the moment we only support payments via PayPal and don’t support any other payment method. Therefore, it is mandatory for you to supply your verified PayPal account details when you redeem FanCoins for cash**. Will PayPal charge me to receive funds? Any PayPal fee will be paid by you and not by Football Fan app. PayPal fee may vary for each country and the fee may include foreign currency exchange fee and/or transaction fee. Please check with PayPal depending upon your country and local currency. How many days will it take to receive cash** into my PayPal account? It usually takes up to 14 working days for cash** to reflect into your PayPal account. Since we are a British company our working days are as per British working calendar. What happens once I redeem FanCoins rewards? Once you redeem your FanCoins rewards in multiples of 1000, remaining FanCoins rewards are still available in your account and you can continue to earn more FanCoins rewards to redeem. Leaderboard ranks Fans based on their FanCoins rewards. It also provides help and various statistical information. I have same number of FanCoins rewards as other Fans but my ranking is low, why? This may be because other Fans might have achieved those many FanCoins rewards before you. You may go past them by contributing more to the app. 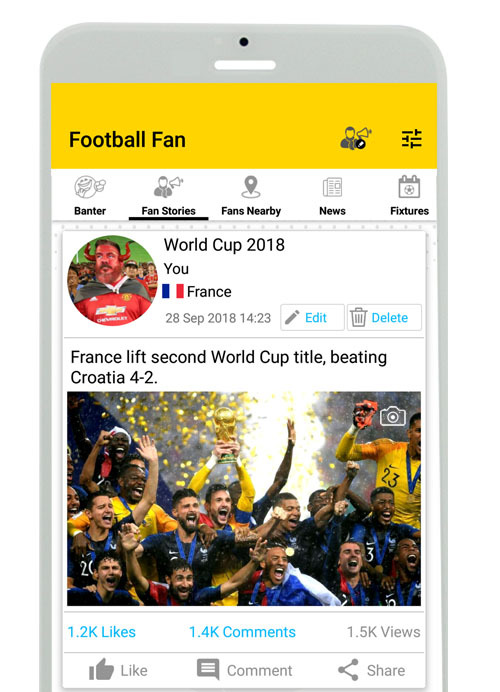 Can you please describe various Fan levels I see on the Football Fan app? 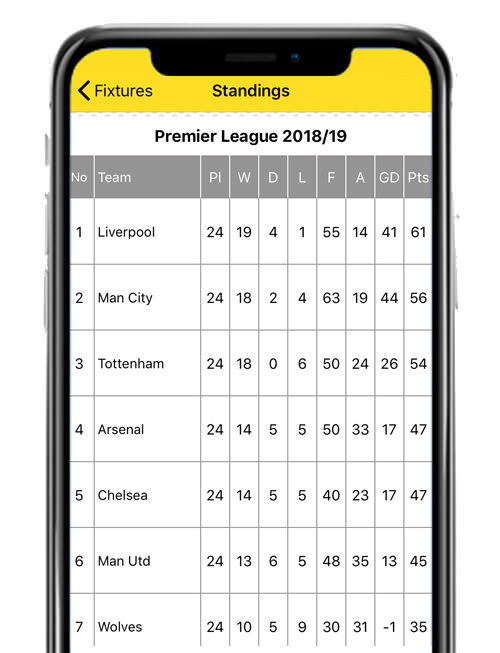 What features does Football Fan app have? c. Find other Fans nearby or in a location. d. Chat with your friends or create a group chat. 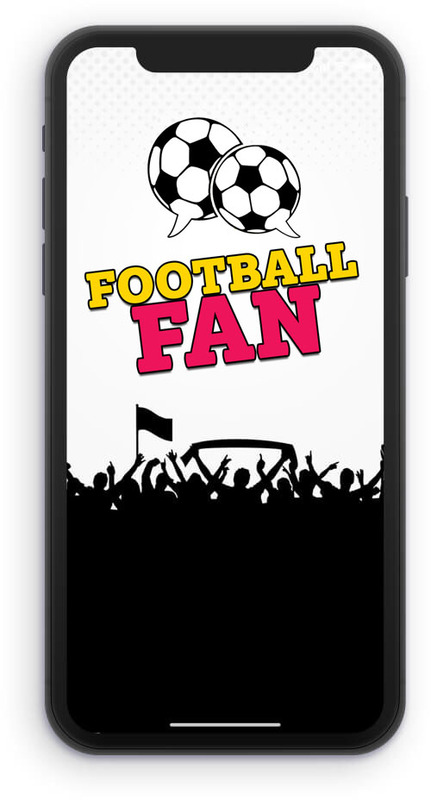 We are constantly adding new features for our Fans, please do send in your feedback at support@ifootballfan.com. 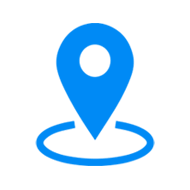 What is Nearby or Fans Nearby feature on the app? Imagine travelling to away games alone is so dull where there is nobody to talk about Football or the away game or imagine if you are a Manchester United Fan in China and wants to gain first-hand experience with a Manchester United Fan in Manchester then Fans Nearby is the feature for you. 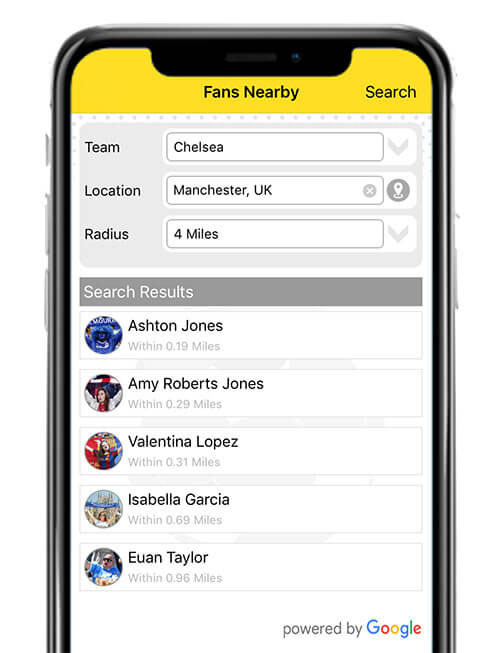 With Fans Nearby feature you can search other like-minded Fans of your favourite Football team(s) as well as Fans of other Football teams either around you or in a given place such as Manchester, UK. You can collaborate with the Fans and share messages, pictures and videos with each other. You never know you may find someone interesting. To maintain the privacy of the Fans, the app provides features to protect your identity under app Settings>>Account>>Profile. What is Fan Stories feature on the app? 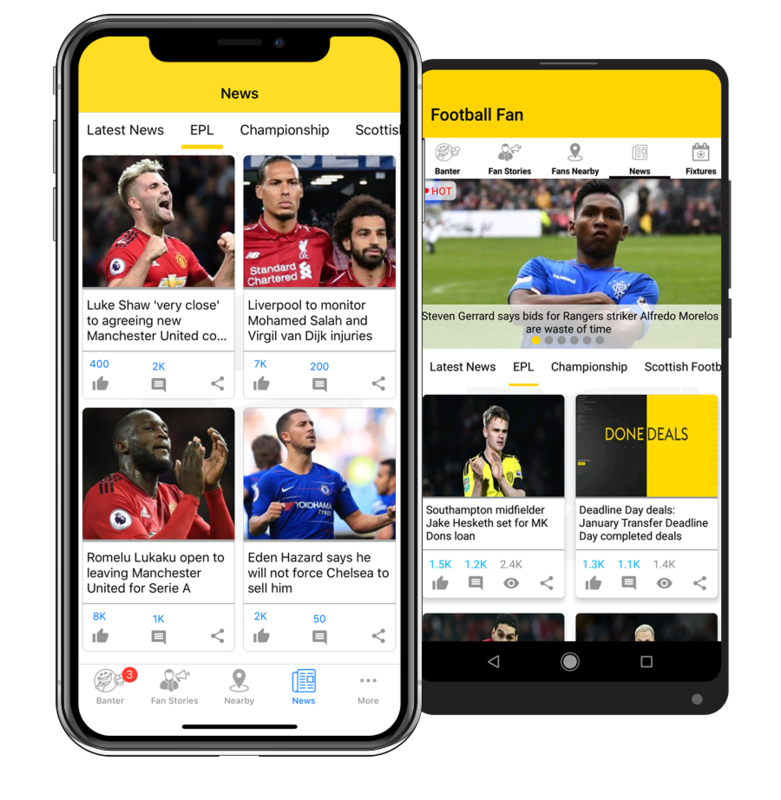 We want all the Football Fans to post their own Football stories in the form of messages or pictures or videos on this app that is dedicated to Football only. 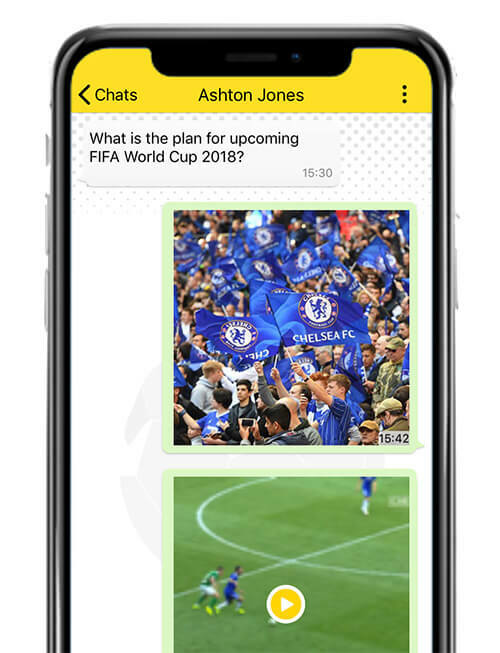 Whether you watching the game in a Football stadium or in a pub or at home, simply create interesting posts of your own and post it on the app. 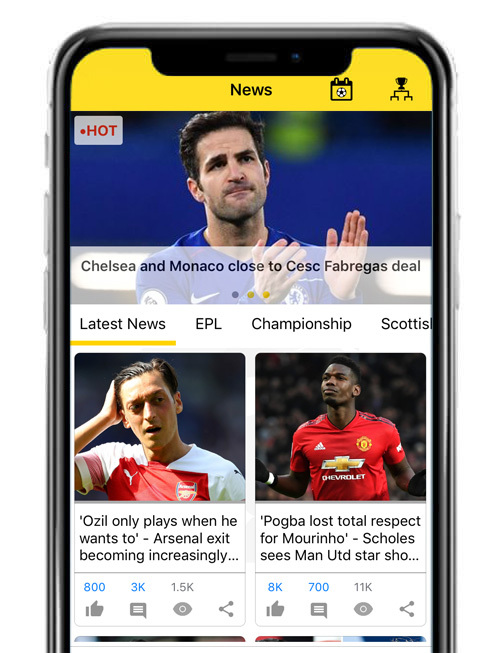 Simply become a Football journalist and use this app to publish your posts. Other Fans can like or comment or share your posts with other Fans or friends. 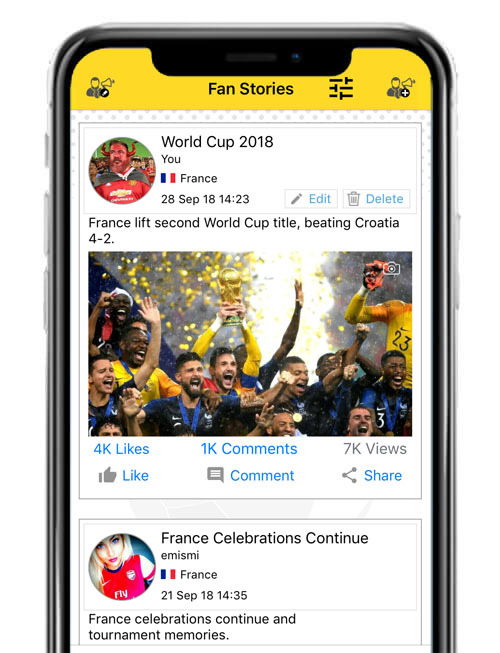 If you don’t wish to get Fan Stories for all the Football teams on the app then just filter Fan Stories for the team(s) that you wish to see. With this feature your Football related posts are no more lost like it does on any other generic platform. Why not try posting your own Fan Story and see the magic? 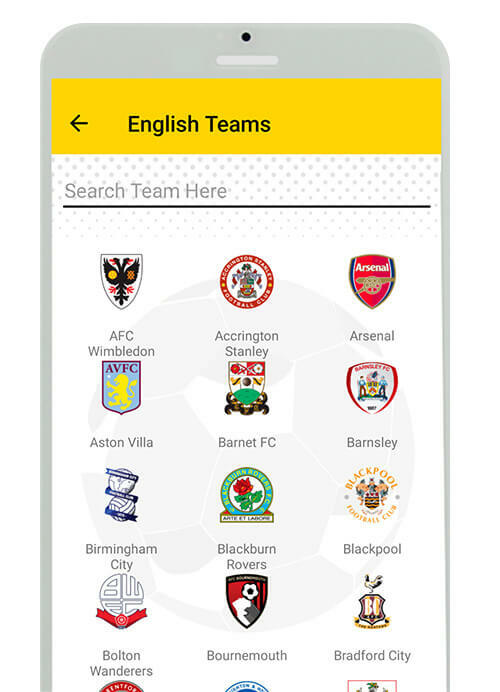 Is Football Fan a mobile app or a website or both? Yes, it is free to download and use. What is a Banter Room feature on the app? 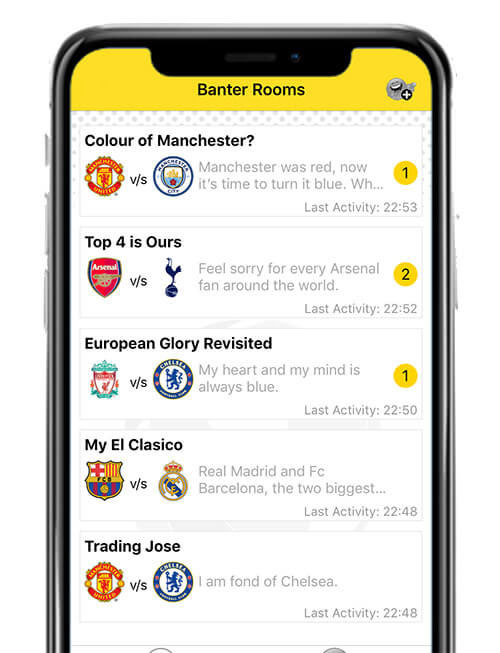 Football Fan brings real life banters between Football Fans on your smart phones in the form of Banter Rooms. We believe that banters are between Fans of 2 Football teams and therefore you as a Fan represents one of your favourite Football teams in the Banter Room. a. 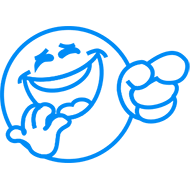 Create your own Banter Room or join an existing Banter Room(s). b. 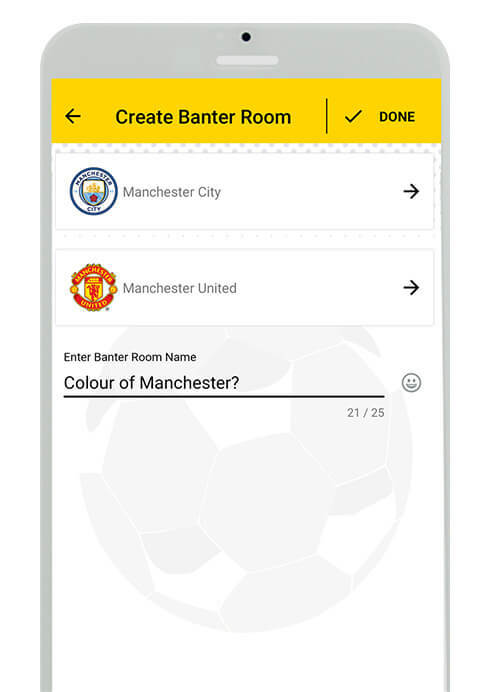 When you create a Banter Room, the app sends automated instant invitation notifications to all the Fans of both the Football teams involved in the Banter. c. Other Fans have an option to accept the invitation by joining the Banter Room or simply don’t join it. d. Once you join a Banter Room you can share text messages or pictures or videos with other participants of the Banter Room. There are several other features which we highly recommend you to explore on the app itself. The app never reveals the identity of participants unless they are already connected with each other on the app. Tell me more about Chats and Group Chat feature? 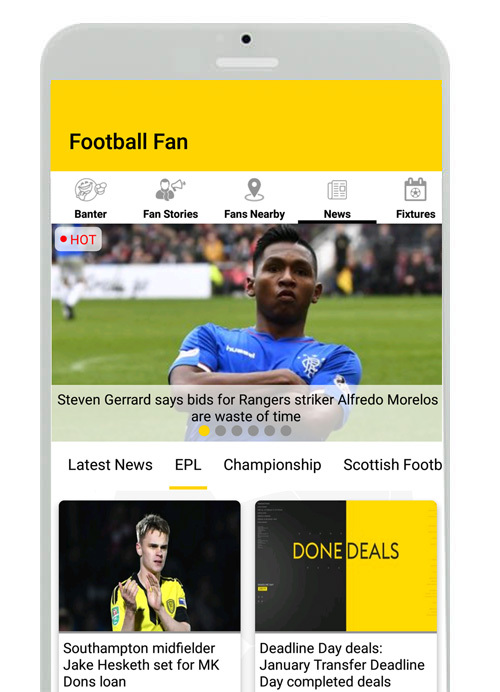 Football Fan app is a one stop shop for everything you would expect from a Football app to do these days. With Chats feature you can have personal messaging with your friend that is also using the app. With Group Chats feature you can create a group from your friends using the app to messages to the group. In both these features you can not only send messages but can also send pictures and videos too. Can I change my favourite Football team(s) later? Yes. You can change your favourite Football team or teams any time by going to app Settings>>My Teams. However, once you change your team(s) you will no longer participate in Banter Room(s) of changed team(s). For example, if one of your favourite teams is Chelsea and you are a participant in Banter Room(s) as a Chelsea Fan. If you decide to replace your Favourite team from Chelsea to Manchester City then you will be automatically removed from the Banter Room(s) where you were participating as a Chelsea Fan.